This weeks assignment was to take a photo of a story but not tell what the story was. I pondered this for the entire week but this afternoon I had only a few hours left. 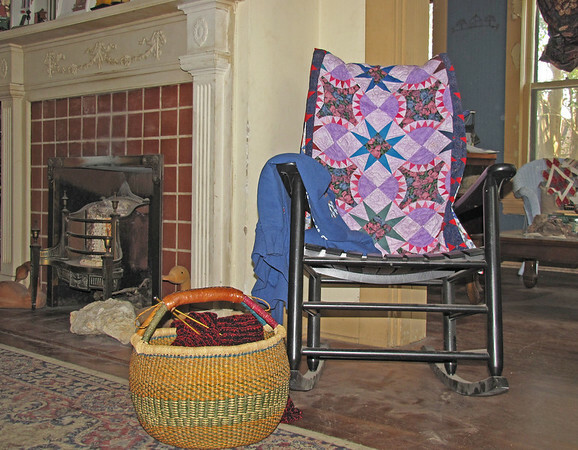 This is a portion of my living room with a rocking chair, basket full of my knitting and sewing projects, the gas log fireplace to one side, an Oriental Rug my husband bought when we first moved into this house thirty some years ago–saying it was $100 and with three active boys–we decided we could spend that much and then throw it away when it wore out—The quilt on the back of the rocking chair was made by a dear friend–now deceased and was probably the last thing she completed. The rock near the fireplace is a limestone crustacean I picked up at a motorcycle rally and the wooden geese I bought with my mother-in-law at a antique fair. The sun room is too sunny and so there are dark curtains over most of the windows–I made them. The crepe myrtles are in full bloom outside. And I dropped my camera full on its lens–so it will go to the shop and I will have to learn how to download photos from my cell phone until this one is either repaired or replaced. It has taken a lot of photos and I really like it but I’m hopeful it can be repaired. Sylvia, I have been getting your posts by email for a while now. Enjoy your writing but seldom come over to leave a comment. Today I had to because the whole thing was so touching and sentimental. It tells a story about you. Plus I think most pictures tell a story or at least I can make up a story about any picture. Beautiful and robust story !